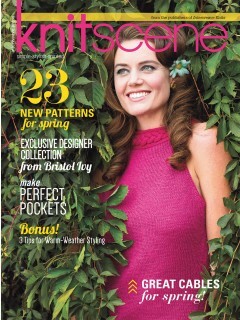 Bursting with 23 projects to knit for spring, Knitscene have focused on beautiful gold-coloured yarns, fresh cables, and knitting perfect pockets. The featured designer Bristol Ivy has a four-piece collection exploring shape and texture, while Emma Welford shares style tips for wearing woollens in warmer weather. Expert knitter Karen Frisa dives into the many ways to add pockets to knitted projects.